Dips are my favorite chest exercise. 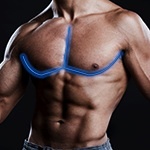 They hit every part of your chest, and really help to get that wide chest that makes you look unstoppable. But it’s important to do dips the right way. Read some of the articles below and know how to do them before you start.